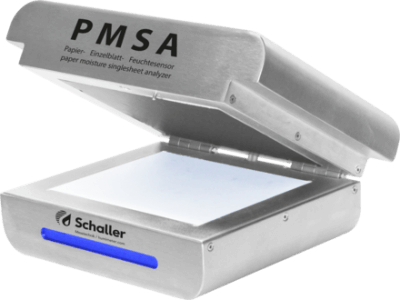 The PMSA is a laboratory instrument for the determination of absolute water content of single paper sheets. Compared to the traditional kiln-drying method, the PMSA paper moisture analyser determines the water content within a few seconds. The PMSA can be used for analysing samples taken directly from the paper machine as well as for the incoming and exit control of paper sheets. The analysis of the measuring results is effected on the PC – the intuitive software provides a user-friendly interface for the display of measuring values, calibration of further paper types and the management of measuring data. The state-of-the-art and long-term stable sensor technology guarantees precise measuring values and extremely high repeat accuracy. To ensure a maximum of accuracy, the system performs a self-calibration of the sensor before each measurement.